I've seen Universal's forthcoming Invasion of the Body Snatchers disc, and, as feared, it's a complete mess. The disc actually features two versions of the film: a letterboxed black-and-white version, and a colorized version (which wasn't mentioned in the press release - understandable, since it's nothing to be proud of). The colorized version, from 1988, is a 4:3 presentation, with horrible, horrible colours, and distracting NTSC conversion artefacts. The black-and-white version is presented in 1.81:1 widescreen format, but without anamorphic enhancement! Amazing to think that a video label of any repute would release a non-anamorphic widescreen disc ten years after DVD made its debut. It, too, displays signs of being sourced from an NTSC master. The film was offered theatrically in Superscope, a format that, rather like Super35, exposed the entire 1.33:1 frame, but matted the image to 2.0:1 for theatrical presentation. (Basically, it was a way of creating a letterboxed image, without the expense of hiring expensive anamorphic camera lenses). For many years Invasion of the Body Snatchers was presented on video and on TV in standard 4:3 format, but, this wasn't created by going back to the original camera negative, it was made by pan-and-scanning the matted widescreen version! The resulting image was therefore cropped on all four sides (compared to the original 4:3 exposed frame). Worryingly, the colorized version runs almost five minutes longer than the black-and-white version (85'02" vs 80'10"). It's hard to see how this discrepancy can be accounted for, even taking into account any variance that might have been introduced in the transfer from film, or from NTSC to PAL! Menu screens, and screen grabs comparing the colorized and black-and-white versions are available here. A new issue of Hammer fanzine par excellence, Little Shoppe of Horrors, has been published by editor Richard Klemensen. Terence Fisher directed many of the classic horror films that set a new seal on what we expected in horror from the 1950s on. The Curse of Frankenstein, Horror of Dracula, Revenge of Frankenstein, Hound of the Baskervilles, The Man Who Could Cheat Death, Stranglers of Bombay, The Mummy, The Two Faces of Dr Jekyll, The Brides of Dracula, The Curse of the Werewolf, Phantom of the Opera, The Gorgon, Dracula - Prince of Darkness, Frankenstein Created Woman, The Devil Rides Out, Frankenstein Must Be Destroyed and Frankenstein and the Monster From Hell. Would horror films be what they are today without the visual and story mastery of Terence Fisher? He was, indeed, “Hammer’s Master of Gothic Horror.” With the assistance of Fisher’s daughter, Micky Harding, we are presenting a complete issue totally devoted to Fisher, his life and films. Neil Barrow spent more than ten years researching the history of Fisher – the man and his films – and talked to many of the people involved in their production. Author Mark Miller calls Barrow’s career article, “gold.” So will you. 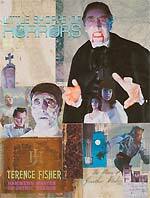 Terence Fisher’s daughter gives you inside details on Fisher the man. Robert Tinnell and Mark Clark use the crypt scene from Dracula to show a great director at work. Illustrated with over twenty-five scene grabs. Three different, but very revealing, interviews/feature articles by three talented writers who got to know and talk to Terence Fisher. Some amazing things here, folks! Stories and memories of Fisher from his colleages: Anthony Hinds, Marla Landi, Jack Asher, Thorley Walters, Francis Matthews, Janina Faye, Veronica Carlson and more. Special Feature by Denis Meikle, who talked to author Wolf Mankowitz and Producer Michael Carreras at length about the film, one of Fisher’s most controversial. Key film critics look at Fisher’s films. Part Two will appear in LSoH #21 (Halloween 2008), a special issue on the making of The Curse of Frankenstein (Hammer 1956). * Loaded with rare behind-the-scenes shots of Fisher at work and personal photos courtesy of his daughter, Micky. * Color paintings by Steve Karchin, Bruce Timm and Mark Maddox, with a special color page of Fisher’s films by Ted Bohus. * Interior artwork by Neil Vokes, Bruce Timm, Adrian Salmon, Murad Guman, Frank Dietz, Mark Maddox and Dan Gallagher.